–– in collaboration with Mashal Khan & Katherine Fisher. What would life look like if you were to devote your life to a plant? What plant would you choose? 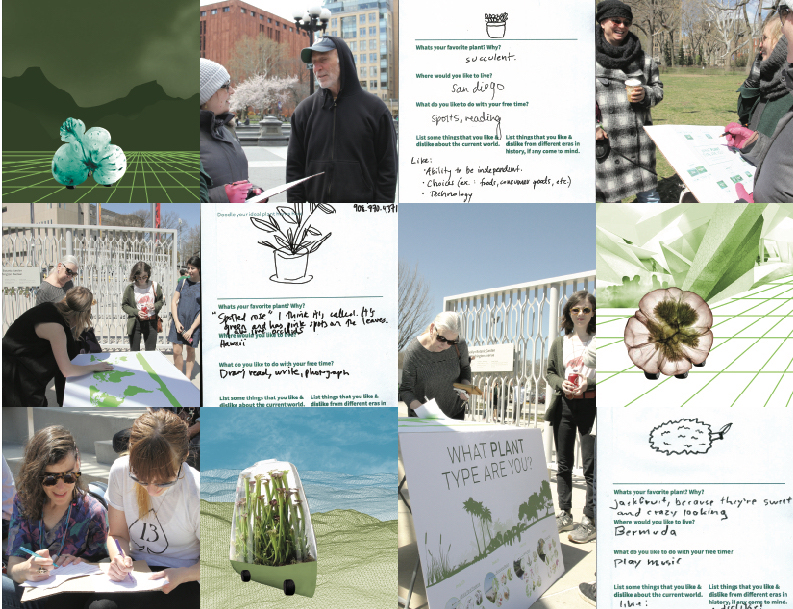 In our planetary denizens project, we explored what it would look like if one person would choose one plant-type in which he or she would devote their life to. The form of each denizens home will be designed around that plant needs and would be autonomously moving towards the best location suited for the plant. The plant would determine the individual’s entire lifestyle and the location of the home. Today’s definition of citizenship is tied to a geographic location and lacks accountability to the planetary scale. The Planetary Denizens movement feel’s the most important right of an individual is the right to make the world they want to live in, without being tied to a geographical boundary. By dedicating oneself to a piece of the earth, they are dedicating themselves to the well-being of the planet. They believe in making actions visible by a new way of living and a new way of being. They believe there could be a new way for accountability towards the planet by dedicating oneself to a small piece of land. They reimagine a new definition for citizenship by changing the geographic ties to a larger globe impacts. The locality of their homes and lifestyle will be defined by the plant. Hence the land they are living in. They believe that the action of dedicating oneself to a piece of the earth will scale to a larger impact and will build a solid set of associational links between individuals by adopting the flexible organizational structure of boundaries. We developed a series of methods to allow individuals in various locations to lay down their hopes and dreams and invited them to co-imagine new living spaces. From the insights, we gathered personal desires and stories and were able to used them to build plant based personas. Personas that then transformed into homes, landscapes and set in motion the first planetary denizen’s movement. The months of May, June, and July are times of complete meditation. Those months are when the Orchid flower is fully in bloom, with constant coverage of the large sphinx moths. I use these months to reflect meditate next to the river before the home moves elsewhere. The night is spent awake during these months, with the moth coverage making so much noise. Every fall me and my partner leave for an adventure visiting our prickly pear friends all over the world, travelling to different desserts at different locations every time. We hope to explore as many places as possible but we trust our beloved venus fly trap in our path, we know that we will be at the right place at the right time. We spend the spring and the summer by making and mixing the alternative medicines we create from our plant. The prickly pear I’ve dedicated my life to is just as resilient as I have become. Living in hot, harsh climates is something I’ve gotten used to. Day and night I create arrows out of the strongest of the prickly pear’s pricks in order to maintain a livelihood. It’s all worth it when the first week of May comes and the first flower appears. I’ve realized that home is what I give, how I feel. Crafting my own definition of home came in the spatial form of my moving home, dedicating my energy to a piece of the world that I know caters to the bigger picture. My biofuel corn home travels every three months to a sunny location throughout the United State. I am a soloist person and that lifestyle of constant motion suits me. I take great pleasure of dedicating my life to growing food and to give back to the planet one of the most important resources all living creatures needs. Being able to structure my life around my plant needs is something I take great pride of and it allows me to live my life in an eco friendly environment as I always desired.